President Recep Tayyip Erdoğan gives a speech during ruling a Justice and Development (AK) Party provincial chairmen meeting at party headquarters, Ankara, March 30, 2018. French President Emmanuel Macron's offer to mediate between the PKK terrorist group's Syrian affiliate People's Protection Units (YPG) and Turkey, as well as his promise to support the group in Syria, received harsh criticism from Ankara on Friday, with Turkish leadership rejecting the offer and saying the country is determined to clear all threats terrorists posed to its national security. "We guarantee support to the YPG' look what he is saying!" 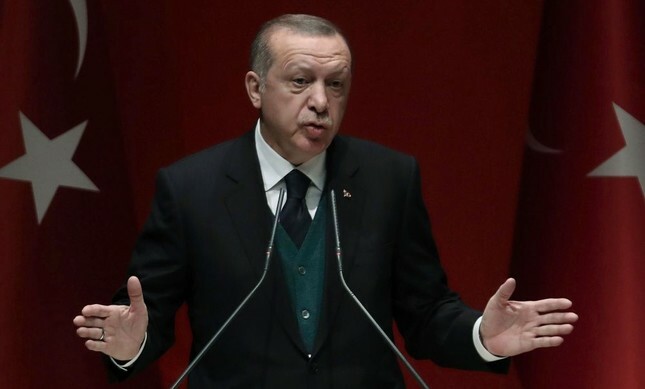 President Recep Tayyip Erdoğan said, referring to Macron assuring support to the YPG in Syria's Manbij, where Turkey has vowed to launch an operation if the group continues to stay, after a meeting between Macron and senior figures of the group at the Elysee Palace on Thursday. Erdoğan said Turkey is very saddened by France's completely wrong approach regarding Syria. He continued: "[T]he words we can be a mediator between Turkey and the SDF [Syrian Democratic Forces], if they were actually said, this goes beyond the authority of the one who said these words... Last week I spoke to Macron himself and found him saying some odd things. As he said those strange things, we had to tell him, with a bit of a high frequency, because it is not up to anyone to put us or our armed forces in a place we can never accept." Erdoğan and Macron held a phone call on March 23 to discuss bilateral and regional matters, where the Turkish president also offered his condolences for the three victims of the Daesh terrorist group-linked hostage standoff in southern France's Carcassonne. Macron and Erdoğan have spoken several times on the phone since Turkey's operation began on Jan. 20. Erdoğan said Turkey does not need a mediator as it does not have it on its agenda to negotiate with terrorist groups. "You may sit on a table with terrorist groups, however, Turkey continues its struggle against terrorist group, like it does in Afrin," the president said. Turkey launched Operation Olive Branch on Jan. 20 on Syria's northwestern Afrin province to eliminate YPG terrorism from its borders and has vowed that it will continue its anti-terror fight until all threats are eliminated from its borders, including Syria's Manbij, eastern parts of the Euphrates River, and also in parts of northern Iraq. "Those who hang out with terrorists and even host them in their palaces will realize their mistakes sooner or later. What we go through can happen to them anytime, too," the president added. Erdoğan also criticized Macron for hosting the SDF and YPG figures in Paris, saying, "those who turn a blind eye to activities of the terror group members should know that this meeting is nothing more than a reflection of animosity against Turkey." After the break out of the Syrian civil war, the Bashar Assad regime withdrew from the northern Syria regions, allowing the YPG, the armed wing of the Democratic Union Party (PYD), to establish a de facto autonomous region, with the support of the U.S. other Western countries. The U.S. picked the SDF, which is predominantly led by the YPG, as its most effective partner in Syria against Daesh. Ankara has long criticized such a strategy, as the PKK, which is listed as a terrorist group by the EU and the US, has organic organizational links with the YPG. The Turkish government has said numerous times that one terrorist organization cannot be defeated by another one, referring to the use of YPG as a proxy against Daesh terrorism. In addition, Turkey has the YPG's aim of establishing an autonomous region in northern Syria is also a threat to Syria's territorial integrity and demographics in areas under the PYD's control. Presidential Spokesperson Ibrahim Kalın said on his official Twitter account that Turkey expects its allies to stand "clearly" against all kinds of terrorism. "Countries we see as our allies and friends should show a clear stance against terror of all kinds, not take steps that legitimize these terror groups," he said. "Turkey's stance on the PKK/PYD/YPG is clear; we reject frivolous approaches such as dialogue, contact or mediation with these terror groups," the presidential spokesperson added. Kalın also had a phone conversation with a principal advisor to Macron, Philippe Etienne, over the issue on Friday.France has a past in Syria, where it dominated as an imperial power from 1920's to 1940's. Many analysts suggest that as fight against Daesh is coming to an end, France is seeking to re-establish itself in the region. Others also say that Macron's recent remarks on Middle East crisis suggest a way to regain his declining popularity at home. Meanwhile, Foreign Minister Mevlüt Çavuşoğlu held a phone call with his French counterpart Jean Yves Le Drian on Friday. Çavuşoğlu also said in a press conference on Friday with his Ukrainian counterpart Palvo Klimkin that "France's offer to mediate is unacceptable." He added that France's aim is not to get results but to play a role in the developments in Syria. Referring to Emmanuel Macron's meeting with a delegation representing the SDF, Çavuşoğlu said that "France's high-level meeting with SDF shows country's 'double standard' on terrorist groups." "I asked French Foreign Minister Le Drian what they would think if President Erdoğan hosted the leaders of a terror group that attacked France in the Presidential Palace in Ankara," Çavuşoğlu said, noting that PKK terror has led to the deaths of more than 40,000 people in Turkey. A French presidency statement said Thursday that Macron hopes "a dialogue can be established between the SDF and Turkey with help from France and the international community." Asya Abdullah, co-chair of the PYD, told reporters after the meeting with Macron that France was planning on sending "new French troops to Manbij." However, Macron's office on Friday said it was not planning any new military operation on the ground in northern Syria outside the international coalition against Daesh. About 10 days into the Turkish operation in Syria, Macron had incensed Turkish officials by saying France would have a "real problem" if the campaign turned out to be an "invasion operation." The comments drew a sharp response from Turkish authorities, saying that Turkey has never been "colonialist" in its history, urging Paris to look at its own past. French support for PYD/PKKA senior lawmaker of the main opposition Republican People's Party (CHP) has slammed the French support for the terrorist PKK's Syrian offshoot the Democratic Union Party (PYD). Speaking to journalists at Parliament Friday, CHP Deputy and Parliamentary Group Chairman Engin Altay said, "France! Know your place! You can do nothing in Syria." Altay was quoted by Anadolu Agency (AA) as saying that France would win nothing by backing terror groups against Turkey. "This puts France into trouble in the international arena," the AA report quoted Altay as saying. "We call on France to review its decision." On March 18, Turkish military and the Free Syrian Army (FSA) took full control of Afrin, with the YPG escaping the town immediately.